Griffith is up and running, introducing Natalie! This article is to quickly note of the start of the pilot at Griffith on the Gold Coast last month, and to introduce USEP to students and staff. 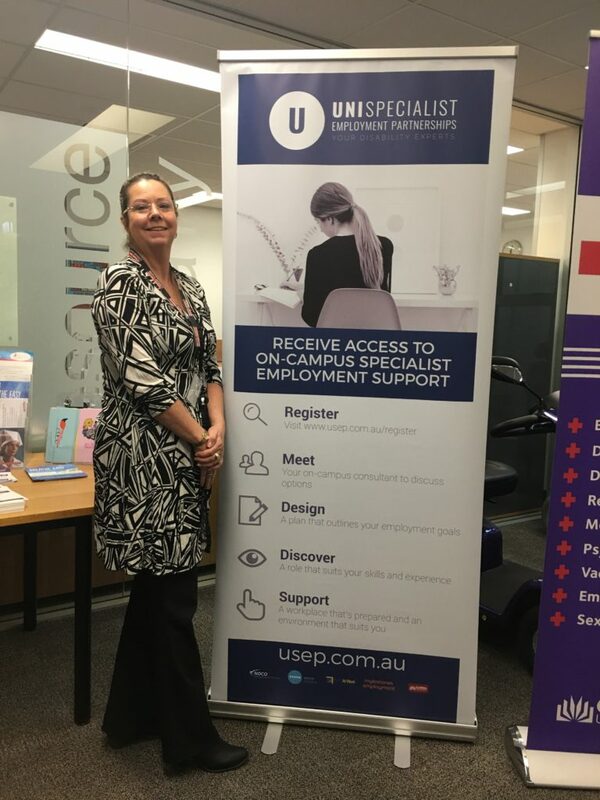 Natalie, pictured, is our first wonderful USEP consultant from Mylestones Employment and is based in an office at the Gold Coast campus at Level 1, in the Student Centre (G33) on Fridays. Natalie will work one on one with graduating or graduated University students with disability to engage in work experience, internships, and find graduate employment either locally or interstate. Students are welcome to register (www.usep.com.au/register) prior, contact us via this website, or simply visit to find out more information. Some eligibility checks apply. Natalie will cover all Griffith locations during the pilot which will run to 30 June 2018 with the possibility of extension, and is working with students who are either in their final year or within 1 year of graduation. Why University Specialist Employment Partnerships? From early conversations with graduates with disability, we know that the general consensus is that standard Disability Employment Services have not been advantageous in the search for graduate careers. We also know that if you did wish to access a Disability Employment Service and you are a full time student, you would be ineligible to do so. If you did access this service as a part time student, we are aware that most Disability Employment Services agencies have not invested the resources, research and development into graduate careers – reasonably so, because it is not a funded item for these providers at present. Further, the focus is not on graduate careers, and is primarily on finding any job as quickly as possible. You can read more about this challenge on our blog post regarding the DES Survey. Compounding this service gap is a significant difference between the employment rates of graduates with disability and graduates without disability. There is also a gap in knowledge in this arena, despite the need for improvement. For this reason we are trialling this specialist service which is focused on graduate employment and is delivered in a time appropriate manner that lines up with graduate recruitment rounds, and works directly on campus with participating students at participating Universities. We believe that the creation of a network of experts who work well with University graduates with disability and business/industry locally and nationally is a strong solution. The pilot has been put together by a team of National Disability Coordination Officers, and is run as a partnership (unfunded at present, hence the limited time!) between Universities, the NDCO’s, and a participating employment providers who would like to specialise in this wonderful field of work. It is based around choice and determination – enabling students to target careers that align with the study that has just been undertaken, and empowering employers to host internships, work experience, and employ graduates with disability with confidence. The trial is limited to students in their final year, or within 1 year of graduation, at participating Universities. At present Griffith University has begun, with other institutions in the exploratory or Memorandum of Understanding phase. If you think this trial should be near you and isn’t, we welcome you to register under “other” so we are able to show demand – however we cannot promise delivery at all Universities as USEP is a pilot only at this stage. If you are currently accessing a Disability Employment Service by choice or in relation to a payment you receive or a combination of both, you will still be able to access USEP as an additional and seperate service while in trial phase – keeping your current obligations and participating in the pilot program additionally. This allows us to focus on doing just one thing well: helping you get a graduate job! You can register by visiting www.usep.com.au/register – or if you are just wanting to have a further chat, please use the contact form on the site!